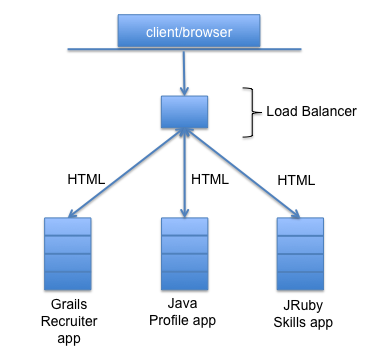 All LinkedIn front-ends were originally built on top of a Java Servlet and JSP stack. As the site and engineering organization grew, so did the desire for front-end technologies that enabled rapid prototyping and development. As a result, we added support for other JVM based frameworks, including Groovy on Rails (Grails) and JRuby on Sinatra. Migrating all of our apps onto a single tech stack would've been a very expensive and time consuming project. Instead, we began to explore a unified rendering layer that is agnostic of the server-side technology: client-side templates. It turns out that there are many client-side templating solutions to choose from. Some are based on Resig's microtemplating (e.g. 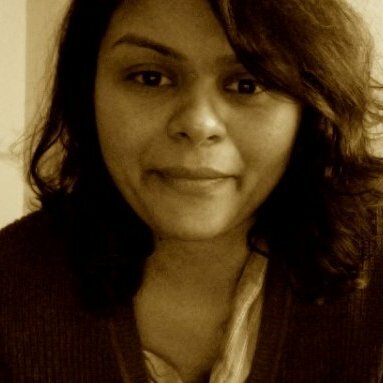 underscore.js), some are logic-less (e.g. mustache), some use a Haml syntax (e.g. Jade), and some are Java friendly (e.g. Google Closure). All told, we evaluated 26 different templating technologies, scoring them on a variety of factors: DRY, JS library agnostic, mature, open source, easy to learn, documentation, flexibility, performance, and so on. After extensive testing and prototyping, dust.js came out the winner. Caching: unlike server-side templates, client-side templates can be served via a CDN to reduce latency for your users and bandwidth and load for your servers. Moreover, the template files can be cached in the user's browser, so after the initial page load, the web server only needs to return the dynamic data as JSON, which is maximally efficient. DRY: templates can be composed of partials, allowing reuse of mark-up and rendering logic, even across different tech stacks. Decoupling: dust.js templates emphasize presentation rather than the application and business logic. 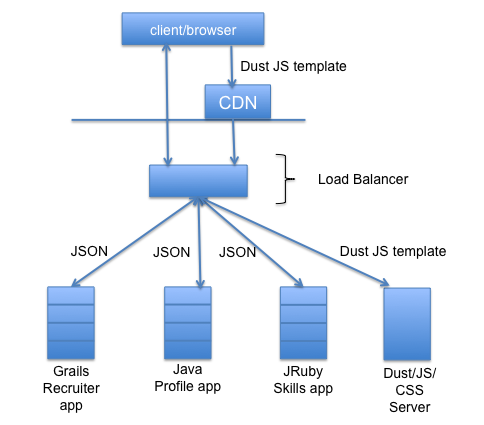 Cross-browser, cross-library: dust.js is compatible with all modern browsers and is JS library agnostic, working equally well with YUI and jQuery. It also escapes malicious template content by default, helping to avoid XSS attacks. Progressive rendering: dust.js templates can render asynchronously and in parallel, so expensive operations can run in the background while the rest of the template is being rendered. When rendering server-side, we can also use the async support to early flush content in chunks so the user sees some content sooner. Simple, powerful, open: the dust.js template syntax is both easy to learn and to extend. We have written custom dust helpers that allow us to perform formatting, i18n, and rendering logic in a clean way. We are actively building and migrating some of our core properties to client-templates to achieve our overall objectives. The next blog post will focus more on the challenges we faced in embracing dust.js templates, including the solutions we are building to extend dust.js for static content flushing, rendering logic, formatting, i18n, and A/B testing partials. Special thanks to Brian Geffon, Eran Leshem, Brent Vincent, Avery Moon, Ganesan Venkatasubramanian, Erran Berger, Aleksandr Movsesyan, Yuri Kurland, Andrew Lottmann, Robert Martone, Brian O'Connor, Yevgeniy Brikman, and Lisa Maneresa.